Restrict Content Pro is a very popular membership plugin for WordPress. This feature-rich plugin allows you to lock your valuable contents only for the members. The simple member management options will help you to manage the active, expired, pending, free, and cancelled users from one location. When using this plugin, you can accept credit card payments by using popular payment methods including 2CheckOut, PayPall Pro, Stripe, BrainTree, etc. The integrated subscription package feature allows you to create unlimited number of packages at various price points. The plugin also comes with readymade email templates for various events like new member registration, payment confirmation, reminder before expiry, etc. You can export the member data as a CSV file. 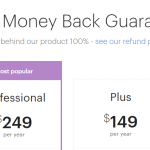 There are several pricing plans for the plugin. The basic one starts at $49 per year.